Positioning and Routing like Google Maps for Events – but Indoors? “I can’t believe it’s working!” was the first user comment I heard for seeing the little blue dot on the huge expo floor plan in the conference app. 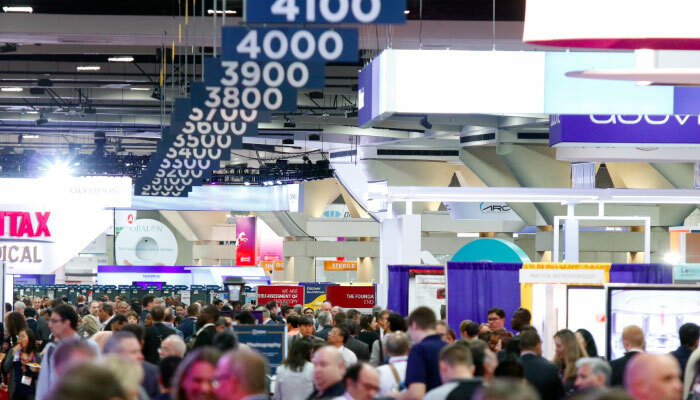 We recently set up an indoor positioning and routing system for Digestive Disease Week, the world’s largest gathering of physicians and researchers in the fields of gastroenterology, hepatology, endoscopy and gastrointestinal surgery. This massive event attracted over 14,000 attendees. It covered 6 of the 8 halls just for the exhibit, learning lounge, and research posters at the San Diego Convention Center. Seeing your current location in relation to the exhibitors, or being routed to one of a thousand posters, greatly improves your event experience. No one would want to miss this feature once they have used it. What does it take to enable geolocation at your event? Forget it, GPS doesn’t work inside! GPS is built into any smart phone and it’s ideal to find the convention center. But it won’t work indoors to find rooms or individual tradeshow booths. GPS requires a satellite signal in line of sight. Glass and clouds are usually not a problem, but any solid object like a ceiling becomes a barrier, blocking and distorting the signal. GPS simply doesn’t work inside, nor would it be able to distinguish which floor you are on. And, unlike street addresses, an expo is temporary where directions are only needed for a few days. So how do I get my blue dot on the floor plan? The solution is an Indoor Positioning System (IPS). While some malls and airports already have these installed, a stationary IPS is not a likely solution for an event or tradeshow. Each event layout is unique and changes from year to year based on the selected venue. 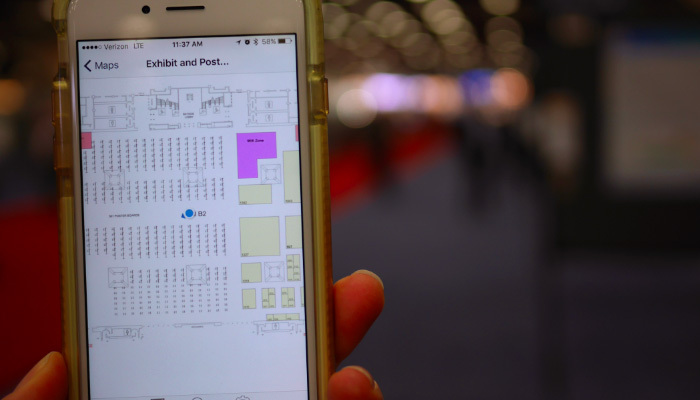 Using iBeacon technology, your conference and exhibit hall can easily be equipped with a mobile IPS. We started working with iBeacons shortly after Apple introduced them in 2013. These tiny devices broadcast a signal much like satellites for GPS. This signal allows us to triangulate the user’s location and display the infamous blue dot on a floor plan! Indoor Routing – How cool is that? For seamless indoor navigation, approximating a person’s location on the floor plan is the first step. 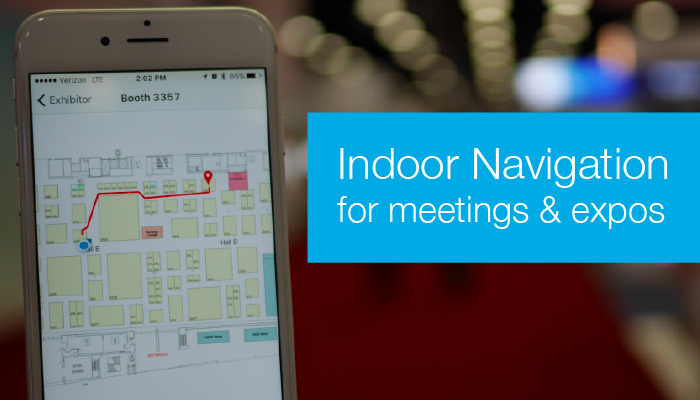 The blue dot helps attendees see where they are in your exhibit hall. But where are they in relation to a specific vendor they bookmarked? Combining the beacon proximity with indoor routing algorithms allows us to draw a path to the desired location. Add the device’s orientation and users immediately know if they are heading in the right direction. Indoor navigation can be as elegant as Google Maps. You instantly see where you are and you are automatically routed to your desired destination. Bring IPS to your next event. Are you ready for #eventtech innovation?